How to prolong service life of shale shaker? Shale shaker has been widely used in the separation industry, such as coal separation, drilling solids control and so on. Incorrectly operating can lead to shale shaker to be damaged easily, directly lower its service life. 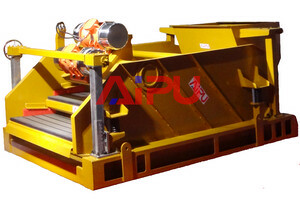 Today Aipu solids control will describe some simple solutions that prolong service life of linear motion shale shaker in drilling field solids control. Working principle is favorable to help us make clear the correct ways to maintain linear motion shale shaker. Drilling mud shale shaker is the first stage of solids control equipment in drilling purification system. Affected by force generated from the eccentricity masses of the vibration motor, the vibration beam generates linear or elliptical motion. Meanwhile, two motors rotate in reverse direction and move mutually to generate vibration which tends to force the whole screen case to move up and down along the vertical direction. Then the drilling mud is tossed upwards and forced to move forward when it falls on the screen. The above motion would repeat when the shale shaker is working and the drilling mud will flow into the mud tank through the screen while the bigger particles will be filtered finally. At this stage, drilling mud purification is done. How to prolong linear shale shaker serving life? According to the above description, we may get general ideas to prolong linear motion shale shaker’s service life. Before starting, make sure that the screen is checked and the hook is well jointed. When the machine is working, try to note that if there are any abnormal noises, and examine if there are any possibility that the bolts is loosened. Also pay attention to the working performance. After working is suspended, clear the machine well enough. In China solids control industry, Aipu is a professional solids control manufacturer in drilling waste management and purification. Aipu is capable of providing customers with such four series as oil & gas drilling solids control equipment, centrifuge, drilling waste treatment equipment and drilling security equipment. Furthermore, we can also customize different type equipment according to customer’s special request. If you are interested, please contact us freely. How to operate solids control equipment?